* This white bristle fitch (100% pure white hog bristle) is cup chiseled to a straight edge and also has a long polished handle. * This is a lettering brush, but because the bristles are longer than the Series 4042, it can also be used for outlining. 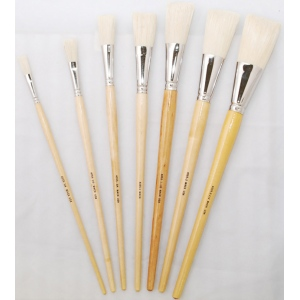 * This brush is best suited for outdoor work such as walls, bulletins and rough surfaces.